Well, it's been a busy fall, perhaps too busy, but one of the genealogical highlights of this season is always the Finding Your Roots all day seminar co-sponsored by the Abbotsford, Surrey and Vancouver Stakes of the Church of Jesus Christ of Latter-Day Saints, the three local Churches with Family History Centers. This year again the Seminar was well attended and very well organized. Everyone I talked to seemed energized by the many sessions given on a wide variety of topics and the opportunities to meet and talk with others - both beginners and experienced researchers. Save the date for next year - Saturday 15th October 2011! One of my talks this year was about researching family photographs and, since one of my aims is to get people to 'make their own history' with family images, I was most interested to learn that one of the attendees already had a photographic project of her own underway. Anna Camporese is collecting vintage black and white photos of people with their pets for an future exhibition - a fund raiser for animal welfare. This sounds to me like a great idea. I'm really looking forward to seeing her exhibit. The audience was enthusiastic too. To submit your photographs, contact her at Anna.Camporese @ shaw.ca (delete the spaces in the e-mail address first) or at 604 760 5235. Now here is one of my family pet photos. 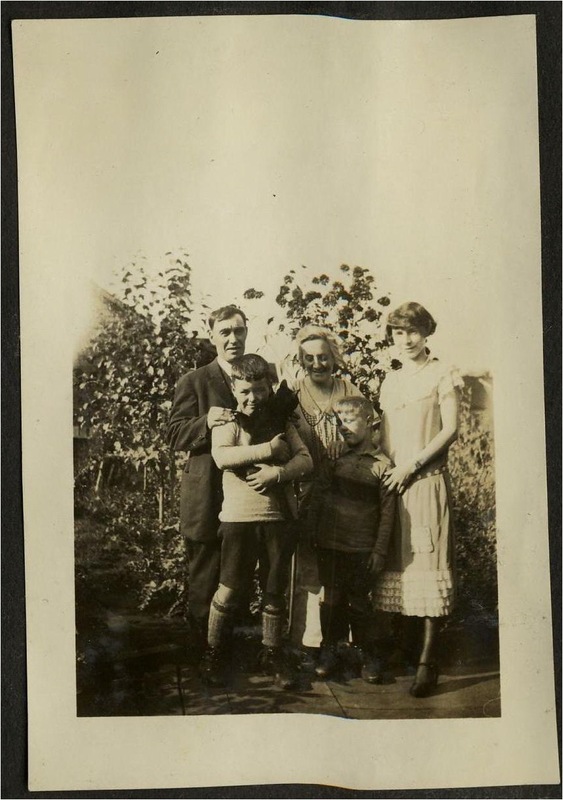 I've posted this one before but it is my favourite - Dad with Blackie the cat, his younger brother, David, their mum and dad, Sarah (Saggers) and Joe Rogers, and (the mysterious) Viola on a visit to Vancouver in 1925. You'll see this one on Dead Fred too with some additional photographs taken during the visit.